Will voluntary conservation measures prevent federal regulation? Last Thursday, the Western Governors' Association released a report detailing the efforts of 11 states to conserve sage-grouse habitat. It's part of an attempt to prevent the bird, which makes its home in sage brush-steppe habitat across the West, from being listed under the Endangered Species Act. It's already been established that the sage-grouse qualifies. But government, business, and nonprofit partners have until September to show the U.S. Fish and Wildlife Service that their voluntary efforts are enough and that potentially costly government regulations are not needed. "It's a smart move," says Brad Chalfant, executive director of Deschutes Land Trust, which is listed in the report as a partnering organization. "The governor's office has been heavily involved in trying to get these agreements in place that would essentially head off necessitating a listing. 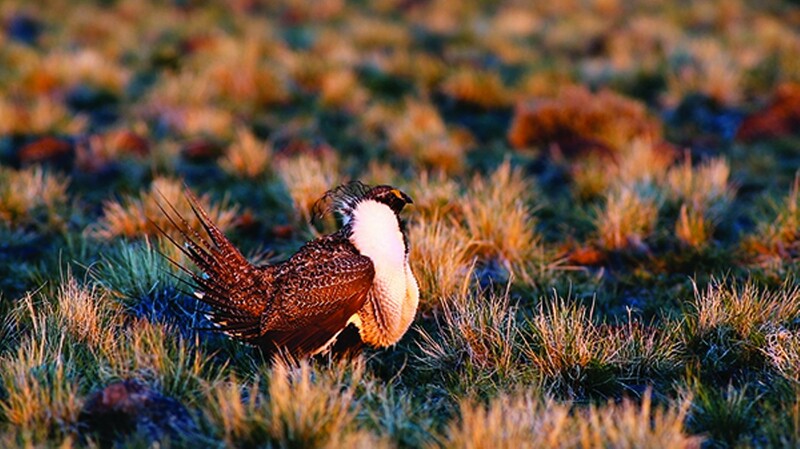 I think everyone agrees the sage-grouse is in trouble." 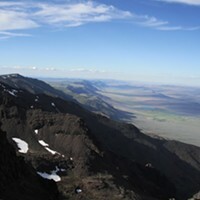 Though the report says little about the work being done in Oregon, the Nature Conservancy's Eastern Oregon Conservation Director Garth Fuller says Oregon is leading the way in many respects. "We're the only state that has all of our sage-grouse habitat covered under the abilty to create [conservation] plans," Fuller says, referencing agreements, like those signed by soil and water conservation districts in Central and Eastern Oregon last month, that essentially allow land owners to get their conservation plans approved and grandfathered into any potential regulations associated with endangered species listing. He adds that the highlight of the work being done in Oregon in the leadup to a decision in September is the relationship building among environmentalists and industrial and ranching interests. "We're all trying to remove the need to list the sage-grouse," Fuller says. "A plan is just a plan, but what's really good is the relationships that have developed." Dan Morse, conservation director for the Oregon Natural Desert Association, agrees that these relationships play a critical role in protecting sage-grouse habitats, but is critical of the emphasis on avoiding listing the bird. "The fundamental question is not whether or not listing the bird does the species any good," Morse explains, but rather whether or not the sage-grouse has the necessary numbers, genetic variability and quality habitat for continued existence. "I think the report comes at that question a little backwards." Instead of looking at whether or not the states' efforts are sufficient to avoid an ESA listing, he says, agencies should be asking if the species needs greater protection. As such, ONDA is neither for nor against the bird being listed. "We want the mechanism that gets us there most effectively or quickly," Morse says. The benefit of the push for voluntary conservation efforts is that it moves the timeline up, he explains. The risk, however, is that these measures may not be as strong as a regulatory approach. As the clock ticks closer to the September decision day, formal conservation plans are in the works at the Bureau of Land Management and the State of Oregon. The plans, Fuller explains, will help give teeth to the voluntary efforts already underway. Previous plans failed to provide sufficient protection in part because they only suggested but did not require closing off any areas to large-scale energy transmission such as power lines and pipelines, Morse explains, and because they did not go far enough in addressing the risks to sage-grouse habitat posed by grazing. In addition to energy and grazing, sage-grouse are threatened by the encroachment of non-native plant species, such as cheat grass and Medusa head, as well as the pervasive western juniper. As the beuarocratic gears continue turning, Morse is connecting with landowners in these habitats to come up with mutually agreeable ways to protect the sage-grouse. And while ranchers and environmentalists may not always see eye-to-eye, Morse says they have a shared interest in ensuring the sage-grouse's continued existence. "They are very easy and pleasant conversations with people who care about the place, often with a long history in the community," he says. "They would say they are champions of the sage-grouse." And it's in their best interest to champion that cause because, as Morse explains, it's not just about the bird. The sage-grouse is an "indicator species," which means that when its habitat is threatened, so too is the continued existence of a number of other animal and plant species—including the grasses cattle use for grazing. "They have a habitat that supports the viability of about 300 other species," he says. "Sage-grouse is a fantastic indication of how that ecosystem is doing." Because sage-grouse is a landscape-scale species—meaning that its habitat spans large tracts of public and private lands—its diagnosis varies from one state to the next. According to the Oregon Department of Fish and Wildlife, the species is doing better in Oregon than in other states. "While energy developers are taking a land rush look at Oregon, ODFW and others are working to balance the needs of the greater sage-grouse with the economic needs of rural communities," the department wrote in its 2011 report on the status of the bird. "To this end, we will work with partners on conservation strategies for key areas and mitigation policies." To illustrate, while the greater sage-grouse population only occupies 56 percent of its pre-European settlement territory, the bird can be found in 80 percent of its former home in Oregon. Still, the ODFW estimates that Oregon's sage-grouse population has decreased an average of 1.6 percent each year since 1980 and that it's about a third the size it was in the 1950s and 1960s.